Now Doctor Who fans can be ready for the cold all thanks to this Tardis And The Style Of The 13th Doctor Winter Hat. The Doctor Who beanie hat is all themed like the shirt that the 13th Doctor is wearing in the same color blue and the famous colored stripes. And to make this beanie all complete they added a pom pom on top and there is a Tardis on the rim too.. The Doctor Who winter hat is one size fits mosts and it is made from acrylic to keep your head nice and toasty when it is cold outside. No more cold head for Doctor Who fans like you because this is a fun Tardis beanie you can wear when ever you want a warm brain. The Doctor Who beanie hat is made from 100% acrylic and that makes it warm and read for winter weather. The hat has rows of blue in different shades and a black pompom on the the top and on the folded edge you can find a cool image of the Tardis that will look stunning when you wear this beanie on your head. Winter, Spring, Summer, or Fall a Tardis beanie is just perfect for anytime of the year. 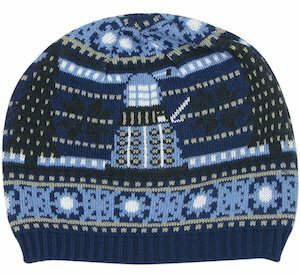 If you are a Doctor Who fan that likes winter then you are going to love this Christmas Tardis and Dalek beanie hat. The beanie hat is Christmas themed but it’s not to obvious so you can wear this Doctor Who hat all winter long. The beanie hat is blue and shows a Tardis and a Dalek and besides that some big Christmas trees and that is about it besides fun decorations that go all the way around. The winter hat is one size fits most and is made from 100% acrylic so that you know it is comfy to wear and nice and warm. This winter you can be warm thanks to the Tardis and Dalek winter scarf that is a must-have for all the Doctor Who fans that like to be outside when it is cold. The 100% acrylic scarf is blue and has rows of Daleks and a row with the Tardis on it too and yes even some other winter and holiday details like Christmas trees and snow. 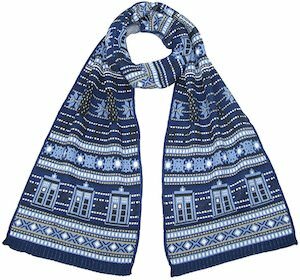 So now you can go on your winter holiday or just clean that snow and you can look amazing thanks to this fun Doctor Who scarf. Winter wear is often boring but if you are a Doctor Who fan you can have a cool scarf. What is the worst things of a cold day? Cold hands and thanks to these Tardis gloves this can be a thing of the past. And these are not just any Doctor Who gloves they are fingerless gloves which means your hands are warm but your fingers are still able to do anything you want that needs them to be free of obstructions. The Doctor Who gloves are Tardis blue and show the windows and the top sign of the Tardis on them. 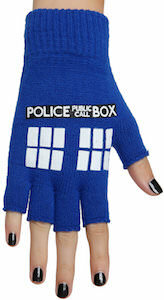 The Tardis gloves are made from 100% acrylic and they are one size fit most so that both men and women can have warm hands and dream away to the land of the Doctor. 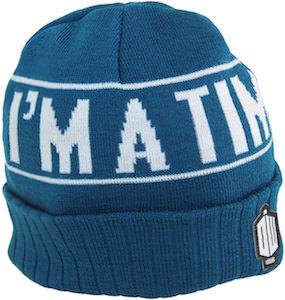 When a Doctor Who fan has a cold head then they should wear this Time Lord beanie hat that is fun and perfect. The 100% acrylic hat is blue with cuff and in the blue they wrote in white letters “I’m A Time Lord” witch of course makes it perfect for the Doctor. After the text is also shows the Tardis and on the cuff they attached the BBC Doctor Who logo. Now it can get cold again because this winter hat will keep you warm and look cool specially to other Doctor Who fans you know who of course all want this hat as well. 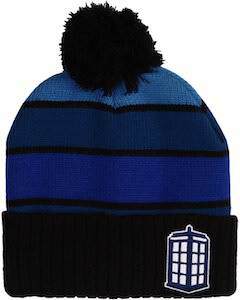 Now any Doctor Who fan can have a warm head while being out in the cold because the Tardis is going to keep you warm. This blue Tardis beanie hat looks like that Tardis with and edge of the white windows going all around and above that the famous “Police Public Call Box” sign going around it to. 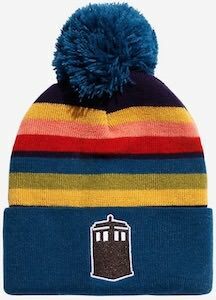 And to top it all off this Doctor Who winter hat has a blue pom pom on top I guess to make it looks like the light on top of the Tardis. Made from 100% acrylic this Doctor Who winter hat is just perfect for those cooler days that are just to cold to be out there without some head protection. No need to have a cold head as this Doctor Who winter hat will keep your head warm while making you look a bit more like a Dalek. This winter hat is white on the top with black on the lower part and yes it is a Dalek beanie hat so it has antenna and the Dalek eye on it to so that it looks really realistic. Beside being great for winter it is also great as part of your cosplay or Halloween costume. 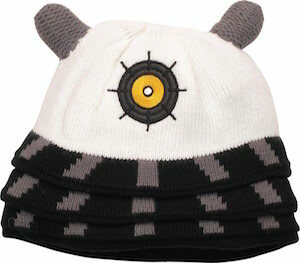 This Dalek beanie hat is made from 100% acrylic and is one size fits most. Maybe the Doctor should try this hat sometimes instead of a fez. If you are a Doctor Who fan looking for a nice hat to keep you warm and to look cool then this beanie hat is what you need. 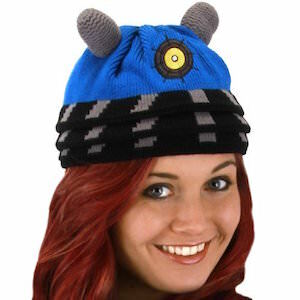 This blue hat looks like the top of a Dalek and that makes you part Dalek when you wear this winter hat. Now you can start exterminating all you want because you are now a Dalek. Made from 100% acrylic this Dalek hat comes in one size fits most and is besides great for winter also great as part of a Dalek costume for Halloween or cosplay. 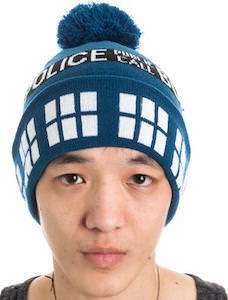 Why wear any boring winter hat while you can wear one specially made for true Doctor Who fans like you!